—Captain Falcon, Super Smash Bros.
Captain Falcon is a character from the F-Zero series. He is an F-Zero racer and a secret bounty hunter, with a mysterious past. In the Super Smash Bros. series, he appears as a secret character in the original Super Smash Bros., then returns as a default one in Super Smash Bros. Melee. In Super Smash Bros. Brawl, he appears as an unlockable character once again, though in Super Smash Bros. for Nintendo 3DS / Wii U he is back to being a default character. Throughout the series, Captain Falcon is known for his blend of speed and power, as well as his various signature moves, such as the Falcon Punch and Knee Smash. In addition, the Male Wire Frame and Red Alloy are modeled after Captain Falcon, having some of the exact same attacks and similar idle poses. 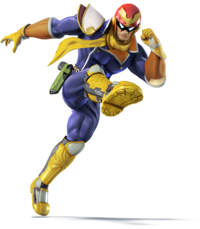 In the Super Smash Bros. series, Captain Falcon is voiced by Ryō Horikawa, speaking English with a false American accent. While Captain Falcon's other Mario-related crossover appearances are very limited, his vehicle, the Blue Falcon, and other elements from his series have featured prominently in later Mario Kart games (with the Blue Falcon appearing as a kart). Captain Falcon makes a brief cameo appearance in "Super Mario: Im Rausch der Geschwindigkeit". When Mario and Yoshi are speeding down the road to rebel against the new speed limit law, one panel shows them speeding past Captain Falcon in the Blue Falcon. Captain Falcon drives up in the Blue Falcon and leaps out of it. Captain Falcon has appeared as a playable character in every game in the Super Smash Bros. series released thus far. He is available from the start in Super Smash Bros. Melee, Super Smash Bros. for Nintendo 3DS, and Super Smash Bros. for Wii U, but is unlockable in Super Smash Bros. and Super Smash Bros. Brawl. Captain Falcon in Super Smash Bros.
Captain Falcon is an unlockable character in the original Super Smash Bros., unlocked by clearing 1-P Mode in under 20 minutes and defeating him on Planet Zebes (since there is no stage based on his own series in this game). Despite having a slow walking speed, Captain Falcon has the fastest running speed. His attacks, however, despite being powerful, are for the most part slow. His design in this game is based on his design from F-Zero X, though his outfit is purple instead of blue. Captain Falcon's special attacks are unique in that none of them are based upon any aspect of his series of origin. His special moves are the Falcon Punch, which involves Captain Falcon charging and unleashing a powerful, fiery punch; Falcon Kick, which has Captain Falcon kicking across the ground; and Falcon Dive, in which Falcon jumps and punches straight up. 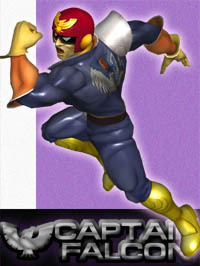 Captain Falcon is also unique in that he has a total of six playable recolors beginning with this installment, with two of the recolors being team battle exclusive. One of Captain Falcon's alternate costumes is that of his evil clone, Blood Falcon, including a patch on his uniform saying "25 - Blood Hawk", which corresponds to the number and name of Blood Falcon's own F-Zero Racer. Another one of his colors recolors the original, brighter colors used in the F-Zero series. 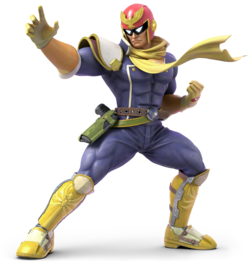 Captain Falcon has the most color changes of the selectable characters in the game, totalling six. Captain Falcon is one of the two default fighters that were unlockable in the previous game, along with Ness. Although, Captain Falcon appears in the Adventure Mode as an enemy as well as All-Star Mode. Captain Falcon appears in Event Matches 12, 17, 20, 33, 36, and 43, and he is one of the random characters in Trophy Tussle 1, 2, and 3. Captain Falcon's fighting techniques are shared with Ganondorf, who has similar abilities, but is slower and has more powerful attacks. 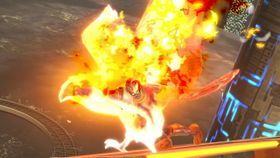 In the transition between the two games, many of Captain Falcon's moves, such as his smash attacks and neutral aerial, have been completely changed and upgraded. He also receives the side special move Raptor Boost, in which he charges forward to deliver an uppercut attack. Captain Falcon has a unique way of using certain items in this game. For example, when using a Home-Run Bat, Captain Falcon slams the opponent down and then up again instead of hitting them across the screen. According to the trophy information of the Star Rod, it has the most power when it is used with a Smash Attack of Captain Falcon or Sheik. Captain Falcon appears as a playable character in Super Smash Bros. Brawl, but is no longer the character with the fastest running speed; that status being taken by Sonic the Hedgehog. His design in this game is now primarily based on F-Zero GX, though he wears a scarf similar to his incarnation in F-Zero: GP Legend. His Final Smash is the Blue Falcon, in which Captain Falcon summons the machine to run over any players he catches. He is an unlockable character like in Super Smash Bros., and can be unlocked by clearing stage 20 in the Subspace Emissary, playing 70 versus matches, or by clearing Classic in 12 minutes on at least Normal difficulty. In the Subspace Emissary, Captain Falcon saves Captain Olimar and his Pikmin from a R.O.B.. Later, he and Olimar save Donkey Kong with the help of Diddy Kong and they join a team with them. After getting through the Subspace Bomb Factory, they meet up with Samus Aran and Pikachu but soon, Ganondorf appears and gets all R.O.B.s in the factory to burn the Ancient Minister and detonate Subspace Bombs to create a giant hole in space. The Minister turns out to be a R.O.B. himself, who joins Falcon's team, and then, after the Subspace Army is taken care of, the whole team decides to leave the area. Captain Falcon calls his Falcon Flyer and after everyone gets on, they are attacked by Meta Ridley, whom must be defeated in a certain time limit. they all fly to The Canyon where they meet up with everyone else. Everyone enters Subspace and find themselves being turned into trophies by Tabuu. King Dedede and his group then arrive and revive Captain Falcon and most of the others until everyone is revived and able to take on Tabuu. Captain Falcon returns as a playable character in Super Smash Bros. for Nintendo 3DS and Super Smash Bros. for Wii U. His moveset, including his Final Smash, remains unchanged from previous games. He appears as a starter character like in Super Smash Bros. Melee. Captain Falcon returns as an unlockable playable character in Super Smash Bros. Ultimate, retaining many of his moves from previous installments. Captain Falcon is faster on the ground and in the air, and Raptor Boost no longer leaves him helpless in the air. Falcon Punch is Captain Falcon's standard special move. While the move is original to the Super Smash Bros. games and does not originate in F-Zero, it essentially became his signature move, to the point that it was occasionally mentioned and used in F-Zero media. 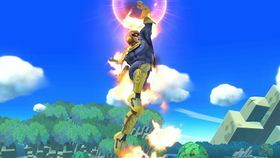 When using this move, Captain Falcon holds his arm back, charges it up, and then pushes forward, attacking with a powerful punch as he yells, "FALCON... PUNCH!" However, if Captain Falcon is attacked during the charging process, the attack is automatically canceled. In Super Smash Bros. Brawl and Super Smash Bros. for Nintendo 3DS / Wii U, Captain Falcon can turn around while charging the attack, which gives the attack more power. 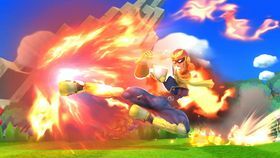 When Captain Falcon succeeds in the attack, the fire that appears around his hand takes on the shape of a falcon. The player can also hear a falcon squawk when doing this. In Super Smash Bros. for Nintendo 3DS / Wii U, the Falcon Punch's first custom variant is Falcon Dash Punch, in which Captain Falcon dashes forward as he performs the punch, though it deals less damage and he is vulnerable before attacking. The second variant is Mighty Falcon Punch, which takes longer to charge up but is more powerful. Ganondorf's Warlock Punch works the same way as Falcon Punch, but is much slower and more powerful, and protects Ganondorf from being launched in Super Smash Bros. for Nintendo 3DS / Wii U.
Raptor Boost is Captain Falcon's side special move. 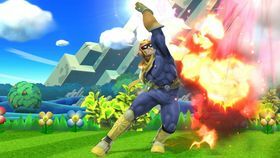 When used, Captain Falcon performs a very swift punch while dashing across the ground and hit anyone who gets in the way, sending them into the air with an uppercut. However, he will stumble and fall forward if he does not hit an opponent. If Captain Falcon executes this move in the air, he flies through the air and punches opponents downward, making the move a meteor smash. However, using this move while airborne leaves him helpless afterwards. In addition, while in Super Smash Bros. Melee and Super Smash Bros. Brawl the aerial version of the move is a meteor smash regardless, in Super Smash Bros. for Nintendo 3DS / Wii U, the opponent must be directly under Captain Falcon in order for the meteor smash to happen. In Super Smash Bros. for Nintendo 3DS / Wii U, the Raptor Boost's first custom variant is Heavy Raptor Boost, which is slower than the default move but is less prone to being interrupted. The second is Wind-up Raptor Boost, in which Captain Falcon steps back before charging forward; the move also charges faster. Ganondorf's Gerudo Dragon move in Super Smash Bros. Melee functions similar to the Raptor Boost. However, this attack sends the opponent flying diagonally upwards, regardless of whether or not the move is used in the air or not. In later games, his Flame Choke uses a similar animation, but is a grab move rather than a punch. Falcon Dive is Captain Falcon's up special move. When used, Captain Falcon punches upwards, which acts as a third jump. In addition, if he hits an opponent on the way up, he will grab them, say "Yes!" and cause an explosion, sending the opponent flying. Captain Falcon can use this attack multiple times consecutively, but only if it hits someone; if it fails to hit, he is left helpless. Ganondorf's attack, Dark Dive, behaves similarly to this move. In Super Smash Bros. for Nintendo 3DS / Wii U, the Falcon Dive's first custom variant is Falcon Strike, which has a higher jump but Captain Falcon cannot grab opponents when using it. The second is Explosive Falcon Dive, which has a more powerful explosion when hitting an opponent at the cost of jump height. Falcon Kick is Captain Falcon's down special move. Captain Falcon yells "Falcon Kick! ", while performing a flying kick across the ground, damaging anyone who is in the way. If performed in the air, Captain Falcon kicks towards the ground diagonally, depending on which way he's facing, hurting anyone he hits. A similar move is Ganondorf's Wizard's Foot. In Super Smash Bros. for Nintendo 3DS / Wii U, the Falcon Kick's first custom variant is Falcon Kick Fury, which hits multiple times and can launch opponents. The second variation is Lightning Falcon Kick, which deals electrical damage rather than fire and can go through opponents. Blue Falcon is Captain Falcon's Final Smash. Upon activating it, Captain Falcon calls the vehicle, and it drives past at high speed and hits anybody nearby as he jumps inside. The victims land on a track, where Captain Falcon speeds towards them and runs them over. When returning to the stage, the victims are automatically sent flying. 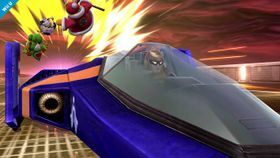 In Super Smash Bros. for Nintendo 3DS / Wii U, the sound effect that plays before starting a race in the original F-Zero can be heard when Captain Falcon speeds towards his opponents. In Super Smash Bros. Ultimate, fiery wings can be seen on the sides of the Blue Falcon. Captain Falcon rides his Blue Falcon into his opponents in Brawl. Though Captain Falcon does not directly appear in Mario Kart 8 and Mario Kart 8 Deluxe, his amiibo is compatible with the game, allowing the player to customize their Miis with a Captain Falcon-themed outfit if the player is to connect the Captain Falcon amiibo to the GamePad. Other elements from the F-Zero series appear in the game in the The Legend of Zelda × Mario Kart 8 and Animal Crossing × Mario Kart 8 DLC packs; Captain Falcon's trademark Blue Falcon and F-Zero themed tracks named Mute City and Big Blue respectively, which even features F-Zero music. Artwork of Captain Falcon from F-Zero X also appears on large television screens around Mute City, along with his signature quote, "Show me your moves!" Captain Falcon appears in Super Mario Maker as a Mystery Mushroom costume, using sound effects from the original SNES F-Zero. It can randomly be unlocked after completing the 100 Mario Challenge on Normal or harder, or unlocked by scanning the Captain Falcon amiibo. 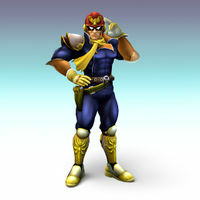 Bio: A regular pilot in the great galactic race F-ZERO Grand Prix, Captain Falcon is skilled at collecting prize money. Much about his past remains hidden in shadow, but it's clear that many a villain held a powerful grudge against him. Instruction booklet bio: "A bounty hunter who boasts speed and power." 08/91 Usually a relentless bounty hunter, Captain Falcon shifts gears to become a race pilot once the F-Zero Grand Prix begins. His beloved racer, the Blue Falcon, can exceed the speed of sound, and he knows how to drive it; he'll go down as one of the all time-greats. Now 36 years old, Captain Falcon wears his F-Zero X visor. Smash B: Raptor Boost Falcon's style is a balanced combination of raw power and speed. His attacks are slow, but when combined with Falcon's high mobility, he's a formidable combat force. The Falcon Punch packs the highest degree of destructive power, while the explosive Raptor Boost can be used to smash airborne foes into the depths. Down & B: Falcon Kick The Knee Smash, used in midair on foes in front of you, is slow and has a short reach, but if it connects, it'll send foes flying a long way on a low trajectory. Falcon uses his Falcon Dive to grab an enemy in midair and fling them away with an explosive blast. He can do this technique repeatedly without landing, so it can also be used as a recovery move. Website bio: "He’s making his entrance a little late, but here he is—the famous F-Zero pilot, Captain Falcon! This time around, he’s bringing his pride and joy, the F-Zero machine called the Blue Falcon, to the brawl. This inclusion ought to boost his macho, tough-guy reputation significantly." Snake: Hey! That's Captain Falcon, isn't it? Otacon: Good eye, Snake! He's F-Zero pilot number 07! Otacon: Oh yeah! That thing! Good idea! OK, ready? Go! GCN F-Zero GX A skilled F-Zero pilot and resourceful bounty hunter. All that's known of his past is that he hails from Port Town. He's won fame and fortune outracing his opponents in his beloved Blue Falcon. His incredible athleticism and never-say-die attitude makes him the pilot to turn to in times of trouble. GCN F-Zero GX (08/2003) In the F-Zero racing scene, Captain Falcon uses his Blue Falcon to win big. His origin largely a mystery, he's made his way to the Smash Bros. battlefield to prove his worth outside the cockpit. He's got speed and power, and his distinct Falcon Punch leaves a dent. Start it in the air to surprise your foes! We love it when this F-Zero pilot from Port Town takes a break from racing the Blue Falcon to take on challengers in brawls. His balance of speed, power and weight is spot on, and his slow but mighty Falcon Punch is oh so sweet when it finally connects. Try starting the attack in mid-air and punching your way into a frantic fray! GCN F-Zero GX (08/2003) Captain Falcon's default down special, Falcon Kick, is no ordinary kick—it surges forward in a fiery blaze. It's a versatile attack that moves sideways on the ground and diagonally down in the air. His forward air attack, Knee Smash, can send an enemy flying for miles if hit just right. The captain's Falcon Kick isn't just any old kick - it blazes either to the side or diagonally down to terrorise the enemy. Its speed also makes it top-notch for surprise attacks! Another move to try out is his forward air attack, Knee Smash. If you get as close to someone as you can before using it, it can launch them miles! N/A Captain Falcon's Final Smash lets him pull opponents into the middle of an F-Zero race-where competitors have been known to break the speed of sound-and run them over with his racing machine, the Blue Falcon. If he manages to grab you, there's no escape. The impact launches its victims diagonally upward. Pit: Whoa... It's Captain Falcon! Viridi: Oh, he's a captain! What ship does he command? Pit: I think he's more like a pilot or something. Viridi: All these fighters have tons of skill and experience, but you can still hold your own. If we brought vehicles into the picture, though, that would be a totally different story. Pit: Good thing that's not the case. I'd be no match for an F-Zero machine or an Arwing. Viridi: Plus, those G-Diffuser systems are terrible for the environment. Pit: Uh, you sure know a lot about space machinery. For being the goddess of nature and all. Palutena: Anyway, if you're near Captain Falcon, watch out for his jump-and-Falcon Punch combo. A skilled F-Zero pilot and resourceful bounty hunter. All that's known of his past is that he hails from Port Town. He's won fame and fortune outracing his opponents in his beloved Blue Falcon. His incredible athleticism and never-say-die attitude makes him the pilot to turn to in times of trouble. Spanish (NOE) Captain Falcon "Captain" remains in English, unlike with the NTSC Spanish version. French (NOE) Captain Falcon "Captain" remains in English, unlike with the NTSC French version. 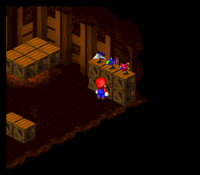 Fēisǔn Duìzhǎng Literally "Flying Falcon Captain"
While Captain Falcon himself does not appear in Super Mario RPG: Legend of the Seven Stars, a model of the Blue Falcon appears in Hinopio's shop. This page was last edited on April 12, 2019, at 11:15.